Fast food has never been tastier than this. When I noticed Fatburger's promotion banner outside a shopping mall, it looked so tempting and the price was too good to miss. 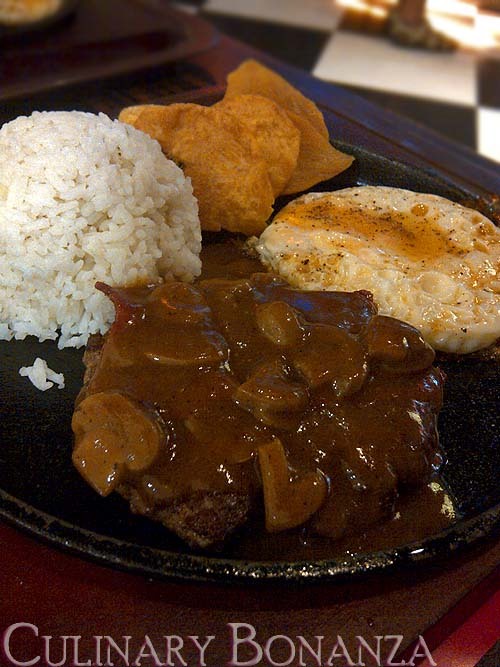 Classic beef rice hotplate style, served with either mushroom sauce or BBQ sauce, fried egg and sweet potato chips. If you have tried Fatburger's burger, you know how tantalizing the beef patty tastes! Imagine having having just the beef patty and a slice of bacon, drenched in yummy mushroom sauce. Now that's a good deal for western food lovers, but who cannot live without your good ol' rice. whoa whoa whoa, itu harga promo nya sampe kapan ?? ?